An enthralling novel about love, loss, secrets, friendship, and the healing power of literature, by the bestselling author of The Knitting Circle. Ava’s twenty-five-year marriage has fallen apart, and her two grown children are pursuing their own lives outside of the country. Ava joins a book group, not only for her love of reading but also out of sheer desperation for companionship. 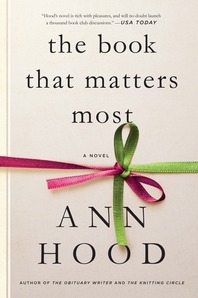 The group’s goal throughout the year is for each member to present the book that matters most to them. Ava rediscovers a mysterious book from her childhood—one that helped her through the traumas of the untimely deaths of her sister and mother. Alternating with Ava’s story is that of her troubled daughter Maggie, who, living in Paris, descends into a destructive relationship with an older man. Ava’s mission to find that book and its enigmatic author takes her on a quest that unravels the secrets of her past and offers her and Maggie the chance to remake their lives.